Your utopia is at hand now, a world where everyone is free to be as nasty and vulgar as they wish without reprisal. The world of the Law of God is one of moral order---not total freedom. But it's citizens, on the day that this world comes, will know of a peace and safety that we do not see at this time due to the destruction of the moral fabric of our country by people like yourself. 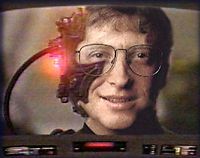 This picture so irritated Bill Gates that his lawyers threatened a small t-shirt manufacturer. Bob Wilson says Bill Clinton Should Stay! If you're looking for the letters column, please come back in a few days! "Required reading for anyone interested in free speech in modern society." Write for the Spectacle! Articles on any ethical, political or legal topic will be considered, whether or not I agree with the opinions expressed. Future issues under construction: On writing; biology and technology.